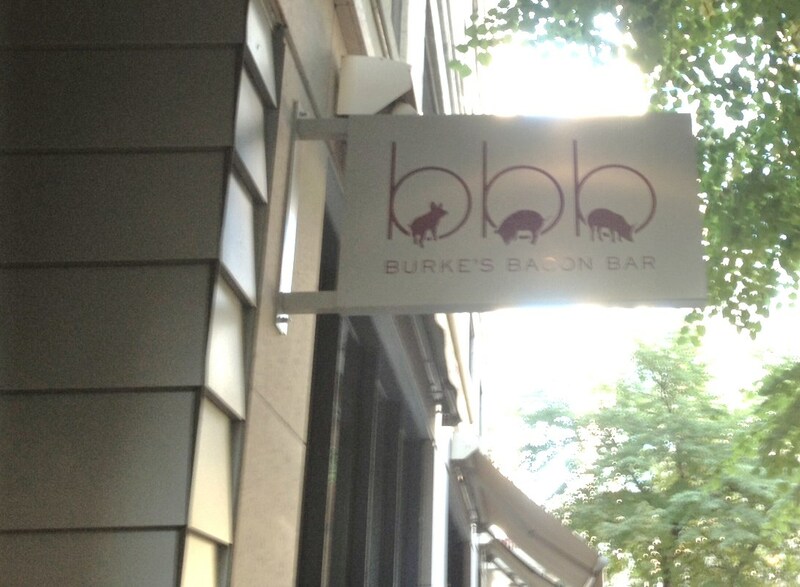 Burke’s Bacon Bar is on North Rush Street attached to the James Hotel and next to David Burkes Primehouse. It is just a short walk away from the Grand red line CTA station. I read about its opening in…. 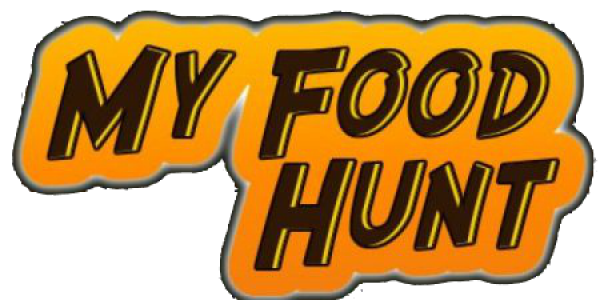 well everywhere to be honest and as I quite like David Burke, and bacon, I was keen to find out some more and see what it was all about. 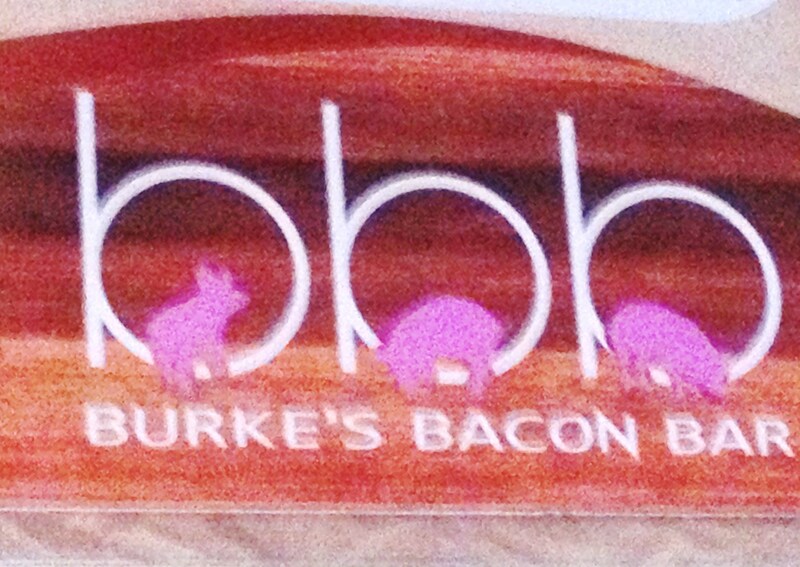 According to their website Burkes Bacon Bar is “An innovative sandwich concept by David Burke“, described as ‘a grab-and-go style sandwich shop specializing in palm-sized, bacon-centric sandwiches dubbed “handwiches.”. 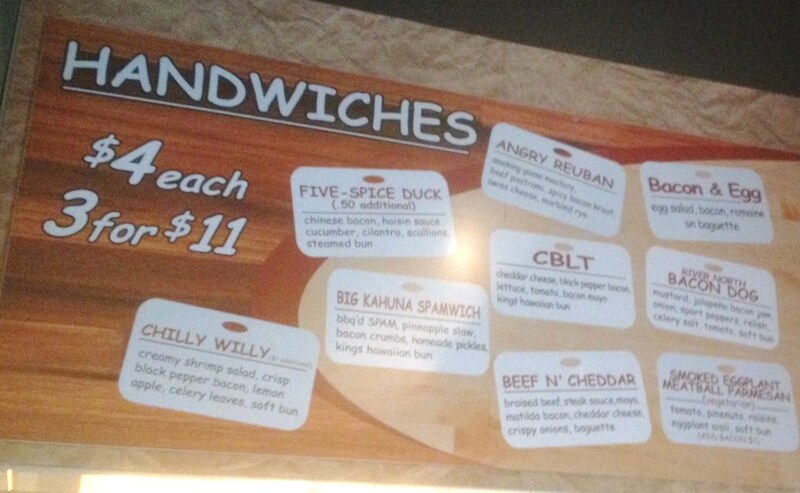 That all sound good, I just hope it is really tasty and that the ‘handwiches’ are good. So what did they have on offer? Inside it was pretty small, basically a ‘hole in the wall’ type of establishment. I wasn’t quite sure what I was expecting, a bar selling bacon sliders, or at least a few seats perhaps, but no it was just a serving hatch outside through which your food was dispatched to you, and a counter inside where you ordered somewhat in the style of a very small subway that only serves bacon. You could then sit on the small wall outside around the plant pots if you had nowhere else to go. After chatting to the lad behind the counter, it turned out that a box of three was about the equivalent to one big sandwich so the best deal seemed to be to get a selection box of handwiches for $11. Once we established that we were going to pick three handwiches, it was pretty easy to filter out the options that best matched my personal taste bias. I was drawn straight away to the Angry Reuben, and the Beef N Cheddar handwiches, then I took a punt on the new special, a Bacon and Egg handwich. 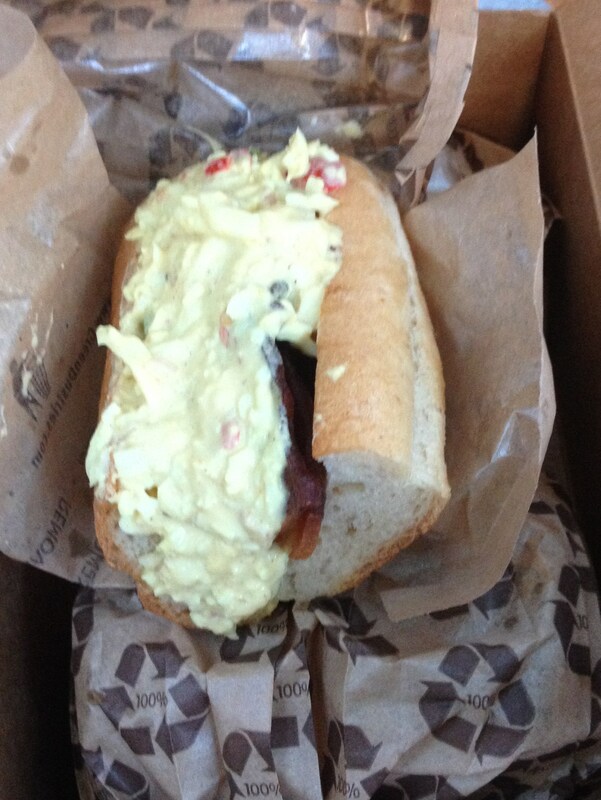 The Egg and Bacon Handwich is essentially a Baguette filled with Benton bacon, curried egg salad, and Romaine lettuce. In reality it is a very big pile of messy but yummy egg salad on top of some crispy bacon. It was a good sandwich, perhaps the egg is overwhelming. 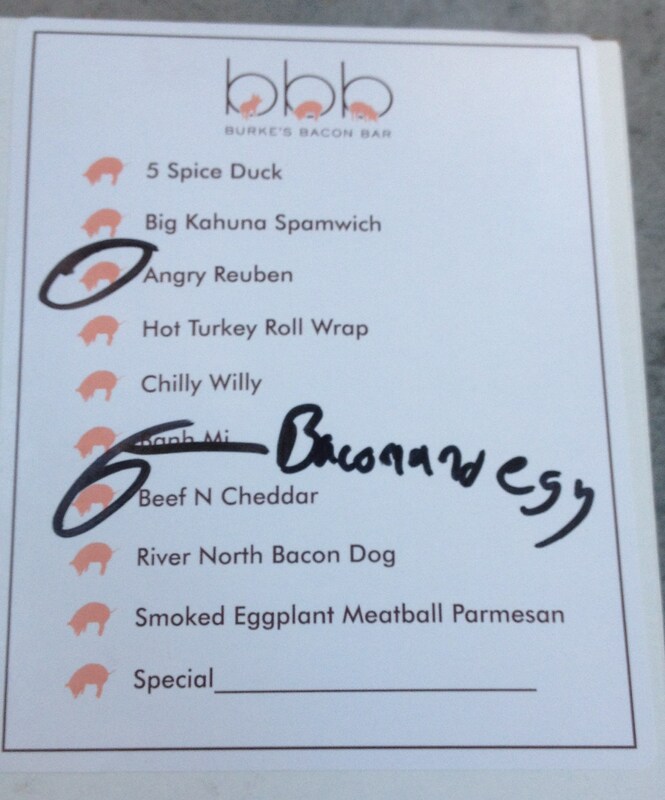 I didn’t read the menu properly and I had been hoping for some sort of fried egg situation on top of my bacon. I still liked it though but not sure that I would choose this combination again. I needed more of a higher bacon to egg ratio to satisfy my bacon needs. 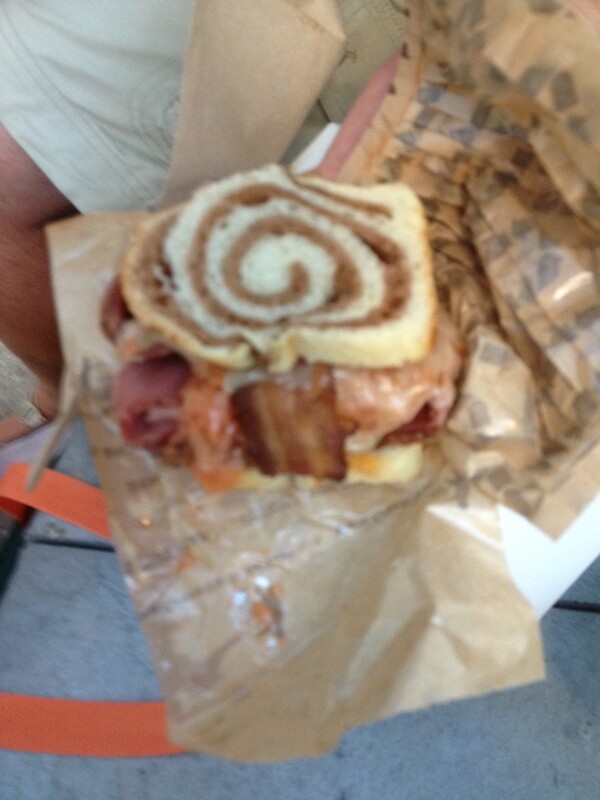 The Angry Reuben was so “Angry” it would not sit still long enough to have it’s photo taken properly. Served in a marbled rye this handwich was filled with smoking goose meatery beef pastrami, spicy bacon kraut, and swiss cheese. 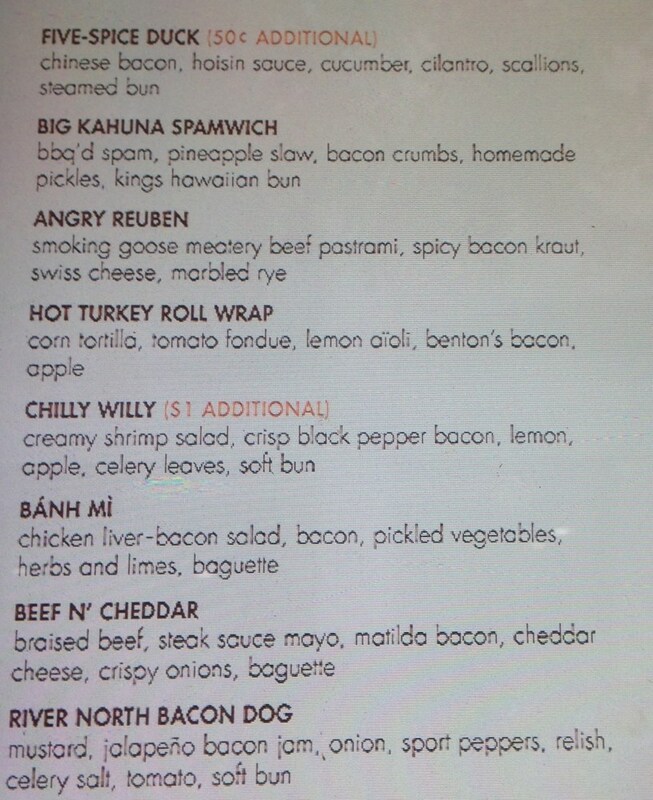 I didn’t really think about why it was called ‘Angry’ until I started to eat it and then I realized they meant really spicy. The meat in this one was good, and the flavor was nice as well, just a little bit too much heat for me to taste the meat properly. Luckily I ate this one last so it didn’t interfere with my tasting of the other two handwiches in the box. I can just imagine the conversation, “you know bacon?”, “Yeh Bacon”, “and you know you like eating bacon sandwiches?”, “Yes I do, where are you going with this?”, “Well my friend I just had this genius idea that we could make them and THEN sell them to other people” Now that my friend is innovation at its finest. Sorry I just could not resist passing comment on that marketing tagline. I think it is a good idea anyway to sell just bacon sandwiches, there are 100’s of vans in the UK doing just that in laybys up and down the country, so why not here? I do like the idea and the concept, but I am really quite a simple man, and all I really need from a bacon sandwich is the bacon and two slices of bread. I want the bacon to always be the star of the show. I would just sell one set of really good plain bacon sandwiches with a choice of brown or white bread and a dollop of brown sauce on the side. 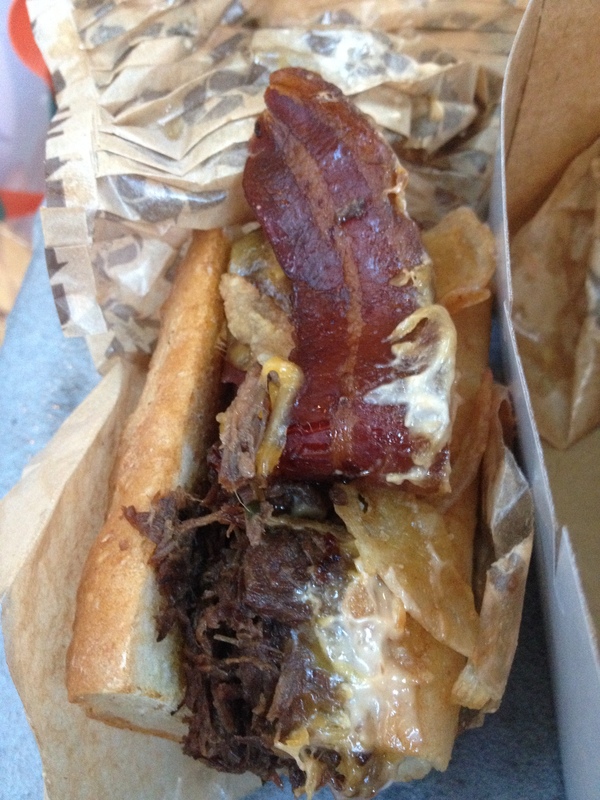 As for David Burke’s Hamwiches selection, well It was a lot of bacon related fun in a box.